Soft & Hard Maple Wood: Why it is a great wood to use for..
Hard Maple is currently used for furniture, cabinets, decorative woodwork, flooring, veneers, cutting surfaces, bowling pins, utensils, and bowls.. Ideal for ballroom and gymnasium floors as well as cutting boards and countertops. We think of fiddleback maple as the wood of choice for violin makers. It looks beautiful and resonates sound to perfection. The soft maples are often used as a cheaper substitute for hard maple mouldings, or in applications where the trim is painted. It is used extensively in the box making industry, and often soft maple boxes are then covered with decorative wood veneers. Generally speaking maples are a great all round woodworking lumber. There are some 200 species of trees and shrubs worldwide. Acer means hard or sharp in latin, somewhat appropriate for many of the family members. The American species are actually divided into two groups: hard and soft. Sugar maple (or rock maple:acer saccharum) is the most common hard maple, the most commercially important and the most abundant type found in the U.S.
Silver, Red Maple and Boxelder are the most common soft maple species. They grow extensively across North America, on both coasts. The commercial species grow tall with relatively decent diameters. The farther north you go the larger the hearts are in the trees and the more colour variation in the wood. Hard Maple: Tends to have cream to white sapwood and light reddish brown heartstock, usually straight grained and sometimes found with high figured bird's eye or burl grain. Bird's-eye resembles small circular or elliptical figures and only found in sugar maple. Clusters of round curls that grow into balls on the sides of trees, are known as burls. They are common in the big leaf maple of the west coast. 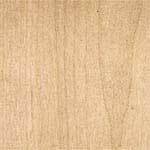 Hard maple is heavy, hard, strong, tough, stiff, close grained and possesses a uniform texture. It sands to a beautiful tight finish. Excellent resistance to abrasion, indentation and shock. Often the heart stock, shows black mineral lines and darker grey streaking, particularly in wood milled in the northern part of its range. Commercially it is usually sorted by colour. Soft Maples: These trees tend to be very similar to the hard maples but much lighter in density. The sapwood can be very white and often show nice curl. The heartwood is tan to gray in colour, often with extreme colour changes on one board. Soft maple is almost never sorted by colour. Both species are relatively stable once dried correctly, but can pose problems in their green state. Maples are notorious for staining when they are first cut. Most mills cut maple and then immediately dry it before it has the chance to stain. Weight: Hard maple:42-45 lbs./cuft. Soft: 35 lbs/cuft. Maple is a beautiful wood to apply a clear coat. The tight grain makes pore filling unnecessary and it is easy to get a glass like finish if you have taken the time to work down the grit and sand with the grain. Staining maple on the other hand can be a nightmire. It just doesn't like to accept stain uniformly, especially dark stains. Fanatical sanding to 400 can, I'm told, eliminate many of the problems, I'm not sure that I believe it though. The wood can look perfect and then with the application of a little stain a blotch can appear for no visible reason right smack in the middle of a wide plank. It has been commmented on extensively but little understanding of its cause or appropriate solution.. Some suggest that the use of a conditioner may make your results more consistent. Try aniline dyes. Many of my customers use a combined spray on stain or top coat + stain combination to try to avoid these strange maple habits. Soft maple is less likely to do this. Hard Maple is probably the most difficult North American species to work with. It is dense and difficult to cut without good sharp carbide tools. If it has not been dried properly the wood can have a lot of tension in it and be very inclined to pinch your blade as it goes through the saw so make sure you have a splitter installed on your table saw. It has high dulling affect on most tools. Prebore for nailing and remove shavings frequently. Watch for burn marks with routers. They are hard to remove after the fact. Always note the direction of feed on planers and jointers. If it tears out, reduce the depth of cut and change the feed direction. Reduced cutting angle for planing or moulding on quartered surfaces. Maple, is though, an excellent turnery wood and requires little sanding if cut with sharp chisels. Soft Maple on the other hand, works much like cherry. It is relatively easy to machine but can tearout on boards that exhibit curl. It sands beautifully. Soft maple holds edges well for corner joinery. Birdseye and other figured maples never like to be planed and always work better with sanders rather than planers. Always move with caution with these woods. All Maples glue relatively well, but the hard maples are so hard that they do not absorb the glue easily, so use a "thick" high viscosity glue, that you are less likely to squeeze out of the joint on clamping. If you tighten excessively, it forces the glue out of the joint and causes "joint failure". Early American settlers used maple ashes to make soap.